It is well known that the major league baseball draft is an exercise in chance, and all the best scouts and newest stats are doing is tipping the percentages slightly. But what isn't well known is that there is a personification of that truism. 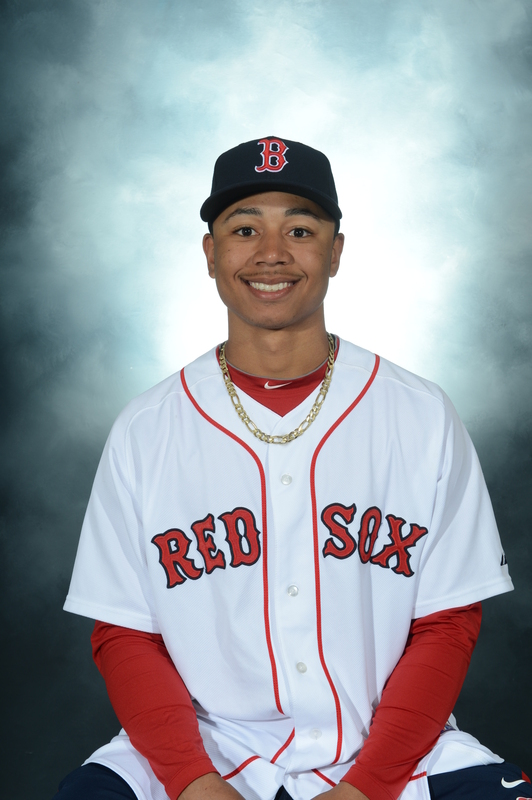 His name is Mookie and he plays for the Red Sox' Double-A affiliate in Portland, Maine. First, you should probably look at him. The man in that photo is 5-foot-9 and weighs 156 pounds, which is to say he possesses the physical stature of a reader of this article rather than the subject. The Red Sox drafted Betts in the fifth round of the 2011 draft, 172nd overall, out of John Overton High School in Tennessee. Before him, Scott Snodgress was picked. After him, Mark Pope. This is not a position portending greatness. His draft bonus of $750,000, while substantial, was at least in part a product of his status as a high school player with a commitment to the University of Tennessee. Betts was picked because of his athleticism, which Boston hoped could translate into baseball skills. An optimistic projection might have had Betts hitting around .300 with a .400 on-base percentage, but with little power. A 'realistic' projection would knock significant portions off both those numbers. Even the most optimistic scout didn't see Betts hitting .400/.450/.600. So it should come as a surprise that he's hitting better than that. As of this writing, Betts is hitting .405/.456/.622 for the Double-A Portland Sea Dogs. It's the kind of slash line that drops when you go 2-for-5 with two singles. It's the kind of slash line you should see three games into a season, but not 27. Betts is a pipsqueak with four homers, 10 doubles and 13 stolen bases (he's been caught three times including, most recently, when he beat the throw but over-slid the bag). He is patient, and has plus speed, but the shock is that he hits for power. Without the power, that's a nice package for a player three years younger than the average age for a Double-A player. With it, we're starting to talk about one of the best prospects in the game. That, in and of itself, is strange. But when you consider where Betts was one year ago, it's even stranger. A year ago, Betts was in Single-A hitting .145/.340/.263. He had some on-base ability (nothing wrong with a .340 on-base percentage), but as a hitter he was rarely squaring the ball up and had no power to drive it when he did. He was just another athlete with few baseball skills, another small guy in a big man's game. He looked overmatched. Had he been on any top prospect lists at the time (he wasn't) that would have pushed him off. One year ago, Mookie Betts was an afterthought in Boston's minor league system. It wasn't that he had no value, it was that his value was met or exceeded by 1,000 other players in the minor leagues. Then he started hitting. He hasn't stopped since. ... and this season, too. Almost as many extra base hits as strikeouts (55 to 57) last season. More doubles than strikeouts this season, let alone homers and triples. An on-base streak of more than 60 consecutive games. Keep in mind, all this is coming from a small player three years younger than the average age in Double-A. Betts has been so good there is already talk of him switching positions because Boston has Dustin Pedroia signed through the 2021 season. Barring an injury, Betts will have to play a different position at the major league level, the thinking goes, and since he's getting called up yesterday -- as many Boston fans would like to believe -- he'll have to acclimate himself to a new position. The truth is, he's not about to get called up, or at least there has been no indication from the Red Sox. Moving him up to Triple-A with a cup of coffee in the majors by the end of the season doesn't seem unrealistic though. But even if Betts spends the rest of the season in Double-A, what he has done over the last 365 days (hit .360/.429/.557) is tremendous. Even so, I'm not sure the most interesting aspect to all of this isn't just how everyone missed on this guy. Part of it is, like Pedroia, Betts is quite short for a star player. * Despite stellar stats in college, Pedroia fell to the second round of the draft for this exact reason. For better or worse scouts are conditioned to look for larger, stronger players, even at positions like second base traditionally played by smaller players. Baseball Prospectus's head prospect writer Jason Parks admitted as much in a recent article entitled, What Did I Miss: Mookie Betts. In it, Parks noted, "I fell victim to size and positional discrimination, and to the size of the samples of my eyewitness experiences with the player. I got too caught up in what Betts wasn't instead of focusing on what he was." In defense of Parks, it is hard to see a guy of Betts' stature hitting for power. Further, it's hard to see it happen at the major league level where the velocity of many fastballs is enough to knock the bat out of weaker hands. It takes more than bat-to-ball skills to hit for power in the majors, it takes bat speed and on an elementary level that requires strength. *Not that Betts is a star yet, but given every team would gladly take him at this point, it's fair to ask how every team passed him over multiple times. That power, if indeed it exists at the major league level, is what will turn Betts from a good or very good player to one of the best in the game. Betts likely won't be a second baseman in Boston, but he has the athleticism to play up the middle somewhere (shortstop, center field, second base), and up-the-middle players with plus defense, speed, and on-base skills are incredibly valuable. Up-the-middle players with plus defense, speed, on-base skills, and the power to hit 20 homers are perennial MVP candidates. So that becomes another question we can ask about Betts. Is his power for real? Is this a skill he can bring with him to the majors or is this just a one season long hot streak? If we've learned anything from the story of Mookie so far, we've learned we can't really know the answer until we're explicitly told, and that won't happen until Betts hits or doesn't hit at the major league level. In the same piece referenced above, Parks admits he still isn't sure what Betts will be once he fully develops, and for a 21-year-old in Double-A, that's not just fair, it's the truth. Right now though, Betts may be the most fun player to watch in all the minor leagues. Earlier, I mentioned Betts' $750,000 signing bonus. It's worth mentioning Betts was, if not an afterthought, then at best, a second choice to the team that drafted him. The Red Sox tried hard to sign another of their draft picks, Senquez Golson, now a defensive back at Ole Miss University, at the cost of Betts. Boston was absolutely prepared -- eager even -- to lose Betts to college if it meant signing Golson. After visiting Fenway Park, and meeting with members of the Red Sox, including front office staff and star outfielder Carl Crawford, Golson turned down Boston's million-dollar offer to return to college. With the deadline to sign players coming fast, the Red Sox turned their attention (and money) to their second choice. The Red Sox had drafted Golson in the hopes of persuading him to sign a million-dollar contract. They drafted Betts in the hopes they'd have someone to throw money at if they couldn't persuade Golson to sign. Golson was to be the incredible athlete who turns his athleticism into baseball skills and becomes a star at an up-the-middle position. Instead, Boston got stuck with one of the best players in minor league baseball. You never know.